Once sound made its way into films many silent film stars soon found themselves out of work. 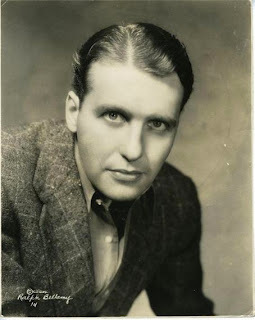 Some silent stars didn't have voices that fit their on-screen image. Others were foreign actors who suddenly needed to be able to speak English, which wasn't an issue for silent films. For many silent actors though, they just didn't possess the ability to memorize and speak lines. The Hollywood studios quickly turned to Broadway in order to find trained actors that could meet the needs of the new talking pictures. This is the era that actor Ralph Bellamy entered Hollywood. Prior to films, Bellamy had been honing his acting skills on the stage, first in stock theatre and eventually Broadway. Just before Bellamy moved to Hollywood he was cast as the part of Texas in the play Roadside, which ran at the Longacre Theatre in New York. What Bellamy thought was going to be a big hit ended up closing after just eleven performances. Fortunately, for Bellamy, he was getting contract offers from a few major movie studios. Bellamy signed with United Artists, headed by Joseph Schenck, and like so many actors during this time, left the stage for the screen. Bellamy took a first class train from New York to Los Angeles. When he arrived in Los Angeles he moved into the Knickerbocker Hotel located at 1714 Ivar Avenue in Hollywood. The hotel, which is now senior apartments, used to be a choice hotel for many newly arrived actors. It was November when Bellamy arrived in Hollywood and the city was dressed for Christmas. The city was having a Christmas parade. A truck pulling a large propeller rolled down Hollywood Boulevard in which a man threw confetti that then blew like snow over the spectators. This was followed by Santa Clause in his sleigh, musicians in folk costumes and various other parade vehicles. It was a hot November, especially for an actor who just came from New York. Rather than going to work right away for United Artists, Schenck loaned out his newly acquired star to Irving Thalberg over at M-G-M. Thalberg, in December 1930, put Bellamy to work in the film The Secret Six, which also starred Wallace Beery, Jean Harlow, and Clark Gable. Bellamy played "Johnny Franks," a bootlegger/cafe owner. One night during the filming of The Secret Six, Bellamy went and had dinner at Henry's Restaurant in Hollywood. Henry's was financed by Charlie Chaplin and operated by fellow silent film actor, Henry Bergman. 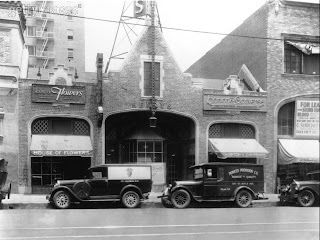 According to the book, The Story of Hollywood, by Gregory Paul Williams, Henry's was the first restaurant in Hollywood to stay open after midnight. It was Al Jolson's favorite spot to eat after the fights at Legion Stadium and was a favorite spot of actress Myrna Loy, as well as many other Hollywood celebrities of the time. "I don't know yet," I answered. "I haven't been here long enough to form an opinion." "I just got eleven thousand dollars for playing a heavy in a Bill Boyd Western," he exclaimed. "Eleven thousand dollars!" he went on, almost in disbelief. "No actor's worth that. This can't last. I've got myself a room at the Castle Argyle [an inexpensive hostelry at the top of Vine Street] and a secondhand Ford. I'm socking away everything I can and I'm not buying anything I can't put on The Chief. This just can't last." While Gable's thinking was wise, his fears never did come true. Both Bellamy and Gable went onto have successful careers until the end of their lives. If you think Ernest Borgnine seems animated on screen you should see just how energetic he is in person. On Thursday, I had the opportunity to hear Borgnine share some personal stories during a discussion with TCM host Ben Mankiewicz, at the Egyptian Theatre in Hollywood, as part of TCM's "Road to Hollywood" series. I was amazed to see, at the age of 94, Borgnine is still a sharp and enthusiastic storyteller. 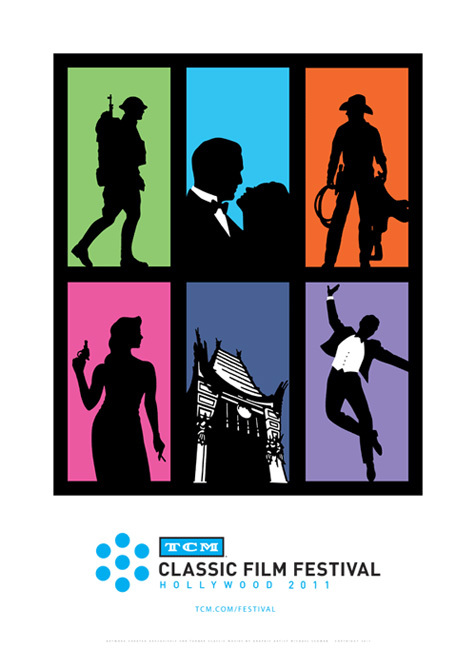 For those who don't know, Turner Classic Movies has been doing a series of classic movie screenings in major cities all around the country, as a build-up for their second annual TCM Classic Film Festival which takes place next week in Hollywood. 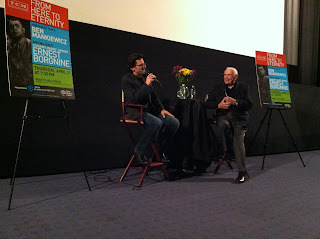 Each screening has featured either TCM host Robert Osborne or Ben Mankiewicz doing a discussion with one of the stars of the film being shown. In this final road stop, the classic film was From Here to Eternity, and the discussion of course, was between Ernest Borgnine and Ben Mankiewicz. The discussion between Mankiewicz and Borgnine was delightfully long, covering such topics as how did Borgnine get into acting, meeting Sinatra for the first time, and working with Montgomery Clift on From Here to Eternity. I recorded just a few minutes of the beginning of the discussion which I've split into the videos below. My favorite is the video labeled "Part Three" in which Borgnine explains how he got his big break in Hollywood. In this first video Mankiewicz asks Borgnine, "why did you become an actor?" In this second video Borgnine talks about acting in a school play, enlisting in the Navy, and his early acting training. In this third video Borgnine is asked how he got his first big break? The discussion between Mankiewicz and Borgnine went well beyond this final video, but this is the last I recorded. In this final video, Borgnine talks about working on the film From Here to Eternity. 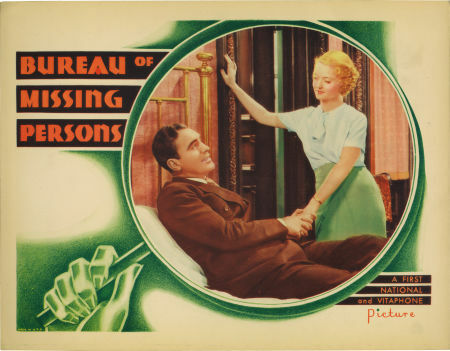 Bureau of Missing Persons, the second on-screen pairing of Pat O'Brien and Bette Davis, is not the greatest film in either actor's filmography, but this fast paced film does have some fine moments. The weakness is in the story, but seeing performances by a young O'Brien and Davis, as well as the comedic Allen Jenkins, make it worth watching at least once. 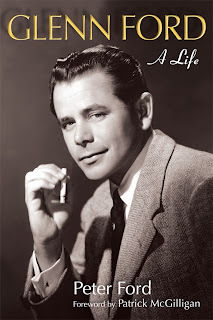 In this screwball crime story, O'Brien plays Butch Saunders, who is assigned to work in Missing Persons because he was too brutal in his previous police assignment. After successfully solving his first Missing Persons case, Butch is assigned to find Norma Robert's (Davis) missing husband, Therme. Butch is attracted to Norma, so when he finds out that she is wanted for murder he doesn't believe it. When Butch is sent to arrest Norma he lets her go. Later Norma's clothes are found at a dock and it appears that she has committed suicide. Butch doesn't believe Norma has killed herself so he stages a fake funeral where both Norma (who has come to see her own funeral) and Roberts have been lured out of hiding. Norma informs Butch that Roberts killed his twin brother making it appear that he himself was dead in order to escape embezzlement charges. Butch and Norma chase down Roberts to bring him into the police department to prove his guilt and Norma's innocence. I've tracked down most of the film locations seen during the chase scene and I'm amazed that for the most part, the locations have changed very little in nearly 80 years! In this first location we see Roberts making his getaway, driving down 8th Street in downtown Los Angeles and making a left onto Spring Street. You will notice that all of the buildings in the background are still standing today. The hotel in the center of the screenshot is still a hotel today. This next location took me a while to find. I kept second guessing myself. I wasn't absolutely sure if this was the location I thought it was, but then I found the proof I needed. 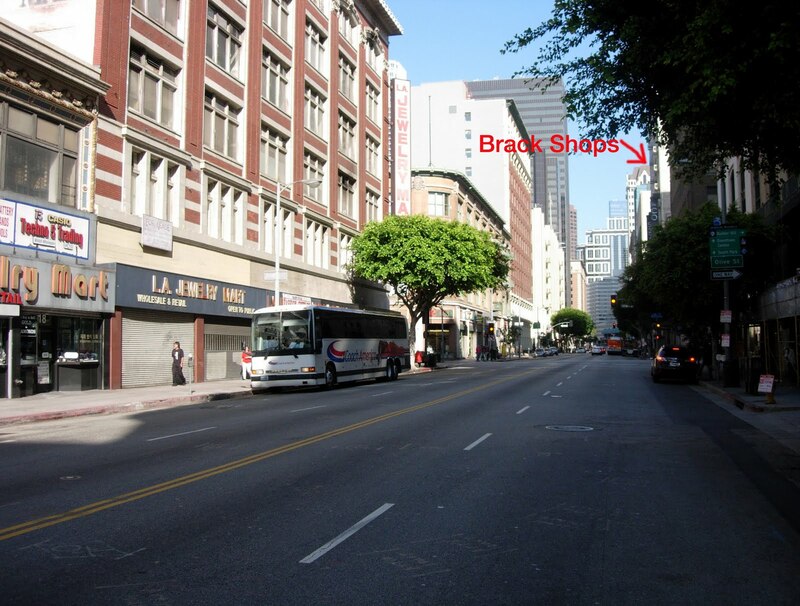 The clue that made me certain that I had found the correct location is the "Brack Shops" sign in the upper right corner of the screenshot. 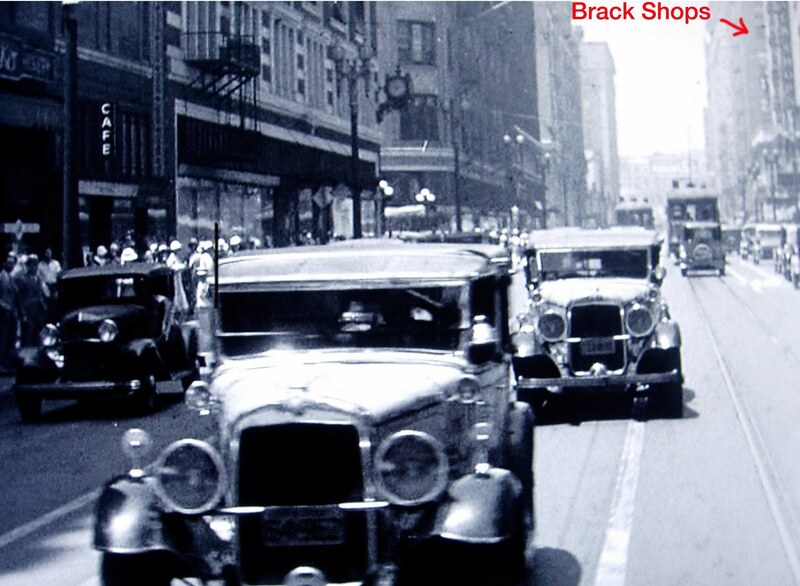 I knew that the former Brack Shops building was located on Seventh Street and that presently it is known as the Collection building. In the next scene we see Roberts being chased down Seventh Street near the intersection of Olive. You can also see this same intersection from different camera angles in my previous posts on the film locations for the Joan Crawford film Possessed (1947) and the Charlie Chaplin film, City Lights. What I find amusing is how Bette Davis used this same film location 14 years before her famous antagonist, Joan Crawford. This third location also took me a while to find. You will notice in the screenshot that the cars are driving by a corner building with theatre popcorn lights. Immediately, I assumed it was the former downtown Los Angeles Warner Theatre. It was the only theatre that I knew of that had a rounded marquee like that and was located on the corner of an intersection. The thing that bothered me though was that none of the background buildings where the Warner Theatre stands matched up with what is seen in the film. 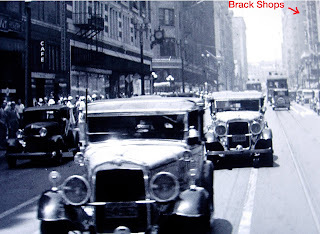 After doing some further research on downtown LA movie palaces I came across an old photo for the RKO Hill Street Theatre which stood at the intersection of Eighth Street and Hill Street. This theatre, like the Warner, was also located on a corner and had a rounded marquee. However, the RKO theatre was torn down sometime in the 1960s. When I went to the corner of Eighth and Hill, although the theatre is long gone, all the other buildings in the background are still standing and very recognizable. See for yourself. This last location was the easiest to find. I recognized it immediately. This is part of the Warner Bros. backlot known as "Brownstone Street." What is incredible to me is how little this part of the Warner Bros. studio has changed since 1933! Of course, you probably will recognize thousands of films that used this location over the last several decades. Bureau of Missing Persons may not be the greatest film, but like I said, the film has its moments. My favorite scene is one of O'Brien and Davis sitting at a lunch counter inside of a diner. A man to their right asks for some sugar, so O'Brien slides the container. Next, a man to their left asks for the ketchup, so Davis slides the bottle down the counter. Then O'Brien asks for the sugar, salt, ketchup, pepper and everything comes sliding back at him all at once in one mess. If you would like to see Bureau of Missing Persons for yourself, it is available through the Warner Archive Collection. There are so many events coming up it's getting hard to find time for them all. Here are a few on my radar. 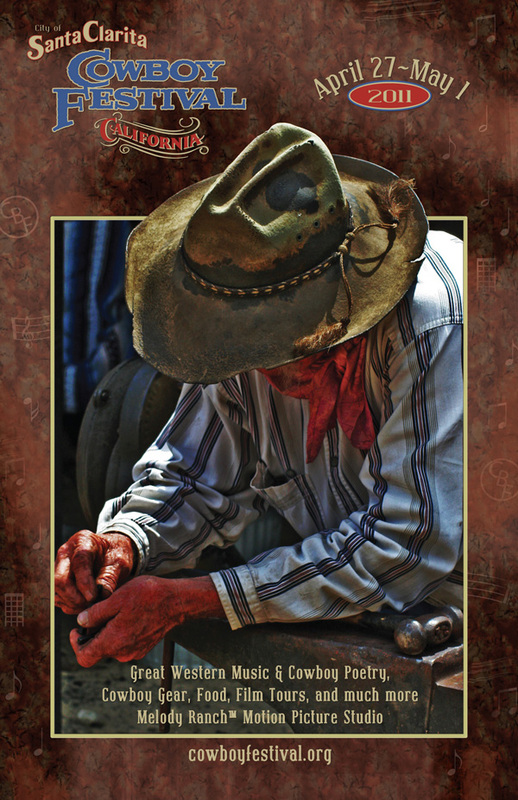 Beginning April 27 and running through May 1, is the Santa Clarita Cowboy Festival. If you are a fan of movie Westerns this event might be for you. Legendary director, John Ford, will be inducted into Santa Clarita's "Walk of Western Stars," which is similar to the Hollywood stars along the streets of Hollywood. There will also be a screening of the classic Ford film, Stagecoach, outside on the Main Street of Melody Ranch, an active movie studio lot where many Westerns have been filmed. Other activities include chuckwagon dinners, live western music, tours of the Melody Ranch, Street Shows, and many other activities. To see full details for the Cowboy Festival visit the official site at: www.cowboyfestival.org. 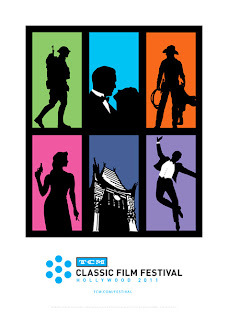 I'm sure every classic film fan is already aware that the second TCM Classic Film Festival is just around the corner. April 28 through May 1, TCM will be taking over Hollywood Boulevard for four nights of classic movie screenings, discussions with Hollywood celebrities and film experts, and the chance for classic movie fans to connect with their movie loving peers. When I attended last year it really felt a little like comic con for the classic film geeks. TCM recently posted the festival schedule which you can view at their official site, along with ticket information and all the other nitty gritty details. Click here to learn more. Last year I made a short video from my visit to the festival which you can watch here. Larry Edmunds bookstore in Hollywood is hosting two special book signings later this month. 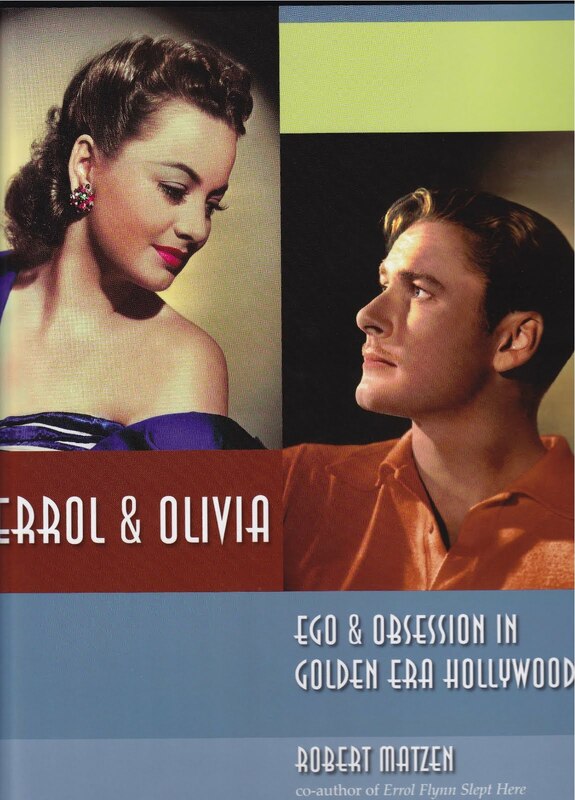 The first, on Thursday, April 14, author Robert Matzen will be in town to sign his engaging read, Errol & Olivia: Ego & Obsession in Golden Era Hollywood. The second book signing is with author Peter Ford who will be signing his new book Glen Ford: A Life. This signing will be held at the Egyptian Theatre in Hollywood and is being tied in with the Noir Film Festival which is running now. To find out more about both book signing visit Larry Edmund's Bookshop. To learn more about the Noir Film Festival visit the American Cinematheque. Laura over at Laura's Miscellaneous Musings has also been writing some reviews from her ongoing visits to the Noir Film Festival. Check Laura's blog out here. This last event which kicks off in May, I unfortunately will not be able to attend, but it is on my wish list of events and I will be attending in spirit. Cinema St. Louis will be presenting "Vincentennial," The Vincent Price 100th Birthday Celebration. Vincentennial willl be held in Price's hometown of St. Louis and will run from May 19-28. There will be many screenings of Vincent Price films along with many special guests in appearance to do interviews, discuss films, present lectures and introduce films. Longtime Price collaborator, Roger Corman will be in attendance to receive a Lifetime Achievement Award. Victoria Price, Price's daughter, will also be participating in the Vincentennial. There will be exhibits of Vincent Price artifacts, artwork and memorabilia, live theatrical performances of the Vincent Price film, The Abominable Dr. Phibes, as well as other Price related events. 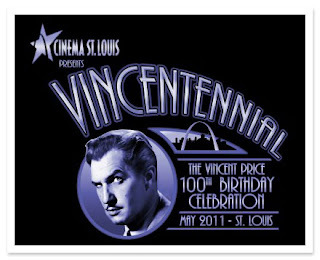 Visit the Cinema St. Louis official site to learn more about Vincentennial. Will you be attending any of the upcoming events? I'm especially curious about the Vincentennial celebration. If anyone attends please report back and let us know how it went! I usually don't participate in these awards or similar blog questionnaires, not that I mean to be a curmudgeon, but I simply don't have the time to keep up. 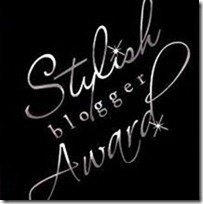 I figured it was about time that I made the time to honor one of these awards and I would like to thank Zoe Walker at The Big Parade blog and Lindsay Blake at I Am Not A Stalker for bestowing to me the "Stylish blogger Award." It is much appreciated. Thanks ladies! Thank and link back to the blogger that tagged me with the award. Award recently discovered great bloggers. Contact the bloggers and inform them of their award. 1. Like some of my favorite old Hollywood stars, Spencer Tracy, Orson Welles, Fred MacMurray, Fredric March, Don Ameche, (as well as many others) I was raised in Wisconsin but have been in California long enough now that I consider "the Golden State" home. 2. I'm not a big sports junkie, but being a former "cheesehead," I love football, especially watching the Green Bay Packers. You can imagine I was pretty excited to see them win the last Super Bowl and bring the Lombardi trophy back to Green Bay. 3. As a kid I always wanted to work at a movie studio, to be where the magic happens. I've been fortunate enough to work at three studios and to have the chance to be on all the major studio lots in "Hollywood." Studios really are exciting places for movie lovers and I still enjoy wandering around the backlots. I don't think it will ever get old. 4. If I didn't work in the film industry I probably would have pursued music. Several years ago I played drums in a rock band but a music career wasn't in the cards. I still enjoy going to concerts, not so much big festivals, but smaller local music venues. Most of the music I listen to is old jazz, 50s & 60s rock'n'roll, and music from the great American songbook. As for new music I'm listening to, I really enjoy Ferraby Lionheart, Pale Young Gentlemen, and Dr. Dog. 5. When I'm not watching movies, I like watching 4-D productions - the theatre. It doesn't have to be a big Broadway production either. I often frequent the smaller LA area theatres. My favorite is the Glendale Centre Theatre, which is a theatre in the round. The audience sits around the stage and the actors come in and out from all directions. This wonderful family run theatre has been going for 63 years now. They are currently showing the musical "Big River" and the show is filled with fun songs, sung by a great cast. Visit http://www.glendalecentretheatre.com/. 6. I like to walk and try to walk places when I can. I am NOT the guy who drives around and around until he finds the closest parking spot to the entrance to a store. I'm also the wrong guy to ask if something is in walking distance, because what I consider walking distance is probably a lot different than for most people. 7. I love dressing well. 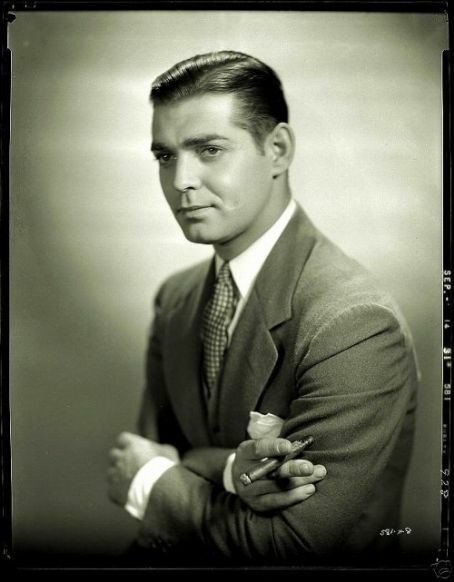 I think it is an extension from my interest in classic film and seeing how stylish and dapper men used to dress. I collect ties, pocket squares, hats and other accessories. Original vintage finds are the best. And I know I drive my wife crazy because of the amount of closet space I take up to hold all of my suits and sport coats - but she is equally competitive with closet space - so I think we both met our match. 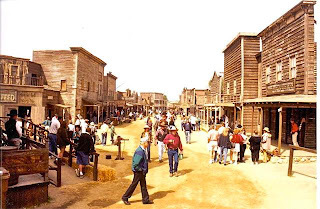 Daveland - This blog is a nostalgic trip through Disneyland and a fun site for any Disney fan. Dave posts vintage images of Disneyland and writes about past Disney attractions. 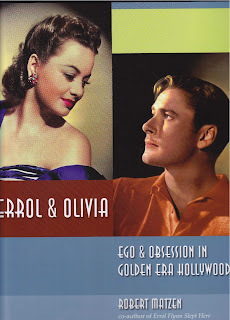 The Kitty Packard Pictorial - Beautiful Hollywood images and engaging writing on various classic Hollywood topics is what you will find here. The Kitty Packard Pictorial recently hosted the Jean Harlow blogathon. Classicflix.com Blog - Classicflix rents and sells many hard to find classic films. This is a great site to keep posted on all the upcoming releases of the classics. The Daily Undertaker - Pat McNally writes about the variety of rituals involved with funerals - the unique, the fun (yes, I said fun), artisitc, creative, emotional, etc. This is a very different and unique blog and an interesting read. Laura's Miscelaneous Musings - Laura writes about a variety of subjects but I especially enjoy her classic movie reviews and reading her "around the blogosphere" posts where she links up to a lot of interesting stories around the internet I might not otherwise get to. 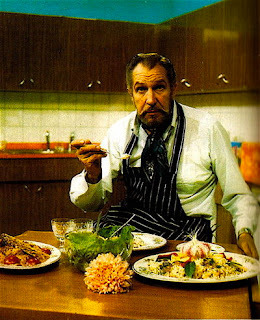 In addition to acting and art collecting, Vincent Price was also known for his culinary expertise. He was the author of several cookbooks and even appeared on television frequently to discuss and/or prepare food. My wife and I own one of Price's cookbooks, "A Treasury of Great Recipes," which is a collection of recipes Price and his wife Mary had collected from their world travels. The book is filled with many delicious recipes and is beautifully illustrated. If you find a copy it is worth the purchase. I recently found online over at Food.com a recipe for "Vincent Price Cheese Delights" which is a recipe from another Price cookbook that I don't own. This past weekend I figured I would give this cheesy biscuit recipe a try. Unfortunately, this recent experiment in cooking didn't quite turn out the way I had hoped. I don't think the recipe that was posted online was complete - something was surely missing, but here is the recipe as I found it and how my cooking venture went. In a bowl, cream together the butter and cheddar cheese. Mix in the flour, salt, and cayenne pepper. Remove from refrigerator and turn out the dough onto a lightly-floured board. Roll dough to a 1/4-inch thickness and cut with a small round biscuit cutter. Place biscuits on a non-stick baking sheet, press a half of a blanched almond in the center of each biscuit, and lightly sprinkle the biscuits to taste with salt. Roll dough into ball and place in plastic. Roll refrigerated dough out on board. Place almonds in center of each biscuit. As I mentioned, I don't think all the ingredients were included or something was left out. The cheesy biscuits turned out ok, but were not what I was expecting. Next time I will definitely be preparing one of the Price recipes from the cookbook which I know are correct. Nevertheless, it was a fun venture in cooking and I think Price would be proud of my culinary experimenting.